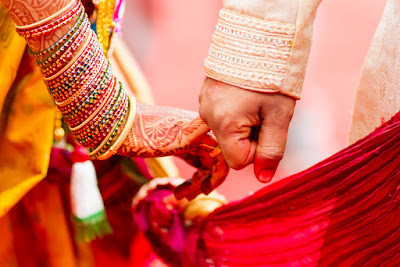 The second marriage occurs when dual sign is in seventh house. In horoscope, the owner of seventh house is in dual sign. If the owner of seventh house is affected by Rahu or sin planet is strong in horoscope then the chances of two marriages occurs. The chances of two marriages occur if Moon or Mars is effective or the radix is 2, 4, 6 or 8. One should do marriage in right dasha and antardasha. Do such remedy for weak planets. Do marriage once again at any religious place after doing marriage. Wear yellow color clothes during marriage time. Wear silver ring in ring finger. It is beneficial to chant Parvati Mangal psalm. Offer water mixing turmeric to Sun. Chant Gayatri psalm with Rudraksha garland for 108 times. Chant this psalm morning-evening. Offer white flower to Shivaling on Friday. Remove clothes and stuff of your first marriage. Wear opal by consulting an astrologer. It is beneficial to do marriage in afternoon. Groom-bide should wear yellow or cream color during marriage. Do not wear diamond. Worship lord Shiva before getting marriage. Avoid black color for one year after marriage. Good Luck: Chant Sundarkand to get rid of litigation and debt. Chant it on Saturday evening. It is more effective if more people join for it.